The VoiceGateDS™® delivers interoperability and seamless connectivity between your staff, residents and extended healthcare network (families, doctors, emergency centers). •	Hallway monitoring alarm display boards. The VoiceGateDS allows for your nurse call events to be tracked and dispatched to the appropriate caregiver in real time. Empower your staff to choose the device on which they prefer to receive the notification, with a click of a mouse, anywhere, anytime. •	Real time locating / Asset Tracking system. What is the Medication Reminder Module? The medication reminder module provides additional functionality that allows for out-dialing campaigns to assigned residents/patients notifying them to take their medication. 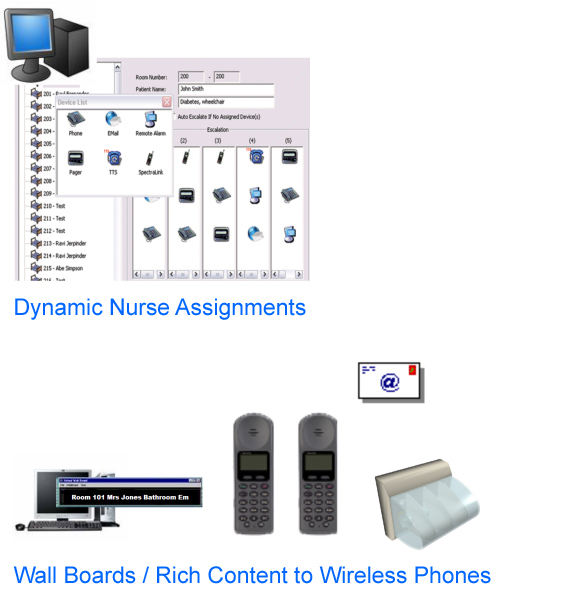 With this module, staff can manage medication within a facility with a click of a mouse. Easy to read reports, failed delivery email notifications, unique recorded messages for individual resident/patients and 3 available campaigns including, message delivery, message delivery with message receipt confirmation and message delivery with confirmation plus conference with nurse. Please Note: the Medication Reminder Module must be used in conjunction with a VoiceGateDS or ICS voice messaging system. What is the Resident Check-in Module? The resident Check-in Module provides the ability for patients / residents to call into the system and perform a check-in and check-out if necessary from each resident suite. With this module, you may assign time slots for check-in and check-out as well as automatic email notification on failed; or, late check-ins. In the event a resident fails to check-in during the assigned time slot, the system will then perform a pro-active call-out to that resident requesting a check-in. If the resident fails to manually check-in; or, the automatic call out fails to communicate with the resident, the system will notify a designated caregiver; or, administrator via email. POWER YOUR HEALTHCARE COMMUNICATION NETWORK WITH THE VoiceGate DYNAMIC SERVER, DELIVERING UNPARALLELED WORKFLOW EFFICIENCY, ENHANCED RESIDENT SAFETY AND AN IMPROVED BOTTOM LINE. Click here for the VoiceGateDS Brochure. Need technical training on our family of products? Need sales training on our family of products? To see more of our products, visit our main website www.voicegate.com. The VoicaeGate Dynamic Server delivers an affordable and integrated solutions for the healthcare industy in English, French and Spanish. Send and dynamically escalte your emergency notification to any type of telephone. Send text message to a single or group of on-site pagers. Send an email message to a single or group of email ready devices (Blackberry™, pda, desktop). Using the VoiceGateDS virtual scrolling marquee, send emergency alarms to a pop up window on your network.